Originally from The Bronx in New York City, Peace activist Jan R. Weinberg has addressed a broad array of social justice issues for quite some time. 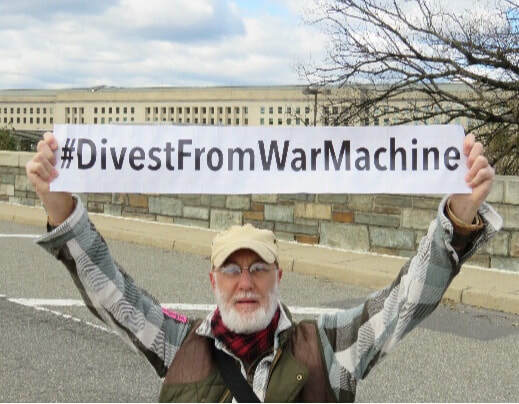 Starting in the late ‘60s, from his radical high-school underground newspaper days - from the Peace Movement against the War in Vietnam and as an Environmental Movement organizer with the original Earth Day. From the mid ‘70s to the early ‘80s Jan owned and operated The Staff of Life – Nutrition Education Center, based in Durham, North Carolina where he addressed healthy eating habits, food distribution systems and hunger related issues. Jan’s more recent “activities” have included organizing and “taking to the streets” with the Occupy Movement, People’s Climate Movement, Stop Mass Incarceration Network, System Change, Not Climate Change, Trade for People and Planet, as well as a wonderful array of Antiwar / Peace movement organizations. On October 2, 2011 through discussions at Zuccotti Park, during Occupy Wall Street, Jan organized Show Up! America whose central focus is to educate the public on how to get involved through civic engagement and effect changes in government, particularly on the local level as a place to start. servitude class structure, environmental degradation and the abdicated Constitutionally ascribed foreign affairs responsibilities of the United States Congress related to issues of trade regulations and war powers. Related to the Indo-Asia Pacific region Jan’s research exposes the consequences related to the projection-of-power militarization aspects of Obama’s Pivot to Asia polices & practices which were designed to export American values and maintain U.S. hegemonic interests while containing a rising China. Fostered throughout the entire Indo-Asia Pacific Obama’s foreign policies (which carried over into the Trump administration) included the establishment & expansion of U.S. military bases, enhancement of military-to-military exercises, forward deployment of strategic armament systems as well as massive sale & gifts of weapons to allied nations - all to the admonishments & adverse reactions of China and N. Korea. Concerted efforts are required to turn back the occupation of sovereign nations and the tides of war.